It’s date night on a slower than usual episode of Penny Dreadful that plays up character pairings like the calm before the storm. Compared to the first three episodes of this second season ‘Evil Spirits in Heavenly Places’ is a relatively calm episode (even compared to last week‘s foray into extended flashback-territory). Perhaps we’re experiencing the byproduct of the series stretching to ten episodes (up from eight in its first season), but this feels more like a Victorian character drama than the psychosexual monster mash we’ve come to expect. That’s not necessarily a bad thing. The laid back character interactions help the Nightcomers’ attack that closes the episode stand out more as a result, and the focus on conversation offers some characters the opportunity to simply relax and let their hair down. Still, it’s hard not to feel like this is the Penny Dreadful version of date night: nearly the entire episode is a series of two person interactions that read like meet-cute, relationship-establishing scenes. *I love that series creator and writer John Logan repeatedly has characters say the word second – just in case we fret that the series will cross that taboo when Frankenstein and Lily inevitably get physical. Ethan (Josh Hartnett) has a dangerous meet-cute with Hecate (Sarah Greene) after she instigates a near horse-and-run in front of him. Unfortunately the second-in-command witch didn’t study her American history very well and Ethan sees right through her ruse. She gets him back, however, when she disses him at Malcolm’s (Timothy Dalton) mansion in full Nightcomer gear. The Creature, aka John Clare (Rory Kinnear) spends some quality time waxing about the beauty of life with Lavinia (Tamsin Topolski) over her sculpted models for the museum. I would be far more enthused about these two if we hadn’t literally gone down this exact same route last season with the actress at the Grand Guignol. The only difference is that Lavinia is blind, which is also a bit of a trope for a doomed romance. That leaves Dorian (Reeve Carney) and Angelique (Jonny Beauchamp), the pair of facially androgynous doppelgangers who prefer to live their own lives rather than the lives expected of them. Not much else to say aside from the fact that their penchant for PDAs could very quickly get them in trouble with the morals police. It’s a surprise that Evelyn Poole (Helen McCrory) and Malcolm are sidelined for most of the episode. McCrory barely appears except to chastize Hecate and Malcolm does little aside from decipher some of the ancient code on the artefacts. Thus far this season Dalton has been surprisingly sidelined. I wonder if that will change any time soon. I will admit that I enjoyed Malcolm’s conversation with Ferdinand Lyle (Simon Russell Beale) about dalliances and the latter’s subtle warning about Poole. This episode is awash in characters rebuffing society-imposed roles, including Dorian’s aforementioned relationship with a trans prostitute, Malcolm’s concern about wearing glasses (ageism), Lily’s displeasure with corsets (feminine apparel), and the problematic status of Frankenstein & Vanessa’s relationship when they go dress shopping. i09 does a really superb job of breaking things down. When Ethan asks Sembene what he was besides a hunter, the mystery man refuses to divulge any details. Do we have a sense of what else he did with Malcolm in Africa? I can’t recall any specifics. Regarding the Nightcomer attack: clearly it’s a lot of show to spook Vanessa’s companions since the Nightcomers had no reason to attack anyone other than her since they were after her hair. As it stands, hiding in the wallpaper proves effectively spooky. The framing and editing of the fight brings to mind X-Men‘s Mystique, who made similar moves using camouflage and a penchant for violence. Can we just once again praise everyone on the creative team for allowing Piper to abandon S1’s atrocious brogue? I find that I can now focus on her acting and dialogue, rather than contemplate gouging out my eardrums with sharpened pencils. Your turn: did you enjoy the quieter episode? Was the Nightcomer attack more memorable as a result? Do you want to see more “happy Vanessa”? Which relationship is more doomed: Frankenstein/Lily or Clare/Lavinia? When will Dorian’s story converge with the A-plot? Are you interested in Sembene’s backstory? Sound off below. 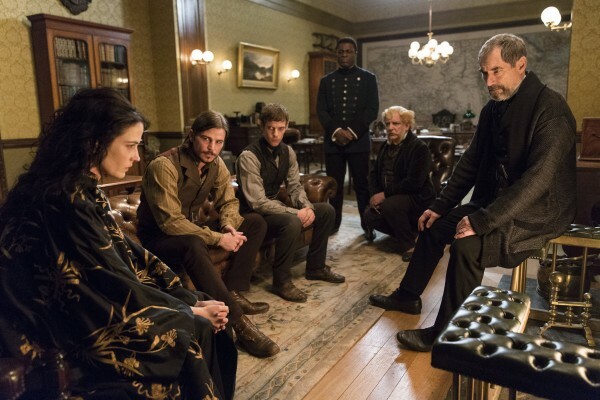 Penny Dreadful airs Sundays at 10pm EST on Showtime. Next week: that freaky ventriloquist doll room is back!